Washing dishes on a backpacking trip is a necessary chore, and an important one if you want to stay healthy and strong as you push your body day after day. Let's take a look at the art and the science of washing your dishes at the end of a backpacking meal, so you can make a clean getaway. If you purchase your camp kitchen supplies through this website, Hiking For Her receives a small percentage of your purchase price but you pay nothing extra. Use Hiking For Her's detailed guide to get what you need, and ONLY what you need, for your backpacking plans. It probably doesn't look like a lot of dishes to clean up after you stuff your face, but believe me, it takes some talent to tackle this task! Especially if your skills at regulating the heat source over your cooking pot are just developing. So let's start with something you use every day at home. It doesn't have to look like a traditional kitchen sink, and it certainly won't be as heavy as one. Hot soapy water dissolves the oil, grease and sticky food components clinging to your backpacking bowls, spoons and mugs. It kills bacteria and viruses from saliva and dirty fingers. It also leaves you with clean fingernails, a perk you shouldn't be too quick to dismiss as silly! Any way to avoid carrying a sink? If you plan to boil water and rehydrate all of your food in foil lined pouches provided by the backpacking food manufacturer, like this, you'll only have to clean and rinse your utensils and mugs, so a sink is optional. washing dishes on a backpacking trip is in your future. This nylon collapsible 10L sink might also be in your future! Set up the sink and stabilize it with the integrated stainless steel ring (not visible in photo), fill it with hot water and soap, and you're all set. Or you can add soap to the dishes (see below for tips), then use this portable sink as the hot water rinse. 10 liters means a lot of water to transport to this sink, so use it only when surface water is plentiful and you have easy access to it. Notice the 2 sturdy webbed handles to make carrying a full sink easier. And it's not much of a leap in imagination to see this sink pressed into service for personal hygiene, washing out your undies, or transforming into a water bowl for your canine companion. It tucks into its own mesh storage pouch and can be nested inside your cooking pot. Weighing 4.7 ounces, you're not even going to notice it. Tip: I find storage pouches to be a necessary part of keeping my gear organized, to make it easy to put stuff away quickly and in their proper places, so it's no small thing to have one for this sink. Alright, you minimalist backpackers, this is for you! You can definitely lick clean your bowl, spoon and even mug if your tongue is long enough, until you feel that it's sufficient for your personal definition of "good to go". But have you met the bacteria in your mouth? A staggering number, and they love to multiply in the food remnants that even you, a devoted licker, cannot remove. So what other options do you have when you want to avoid washing dishes on a backpacking trip? You can wipe out your bowl, cooking pot(s) and mug with paper napkins or towels, and then carry out that trash for proper disposal. To me, this adds unnecessary supplies. And I never do a stellar job of getting all of the grease and grit; by the end of the trip I feel yucky just looking at the dishes. Why not just use the food pot as a kitchen sink? Is the pot large enough to hold hot soapy water and your hands and a bowl simultaneously? What if there is burned on food or grease at the bottom of your improvised kitchen sink? Can you afford the time to let burnt crud soak off before you do the dishes? Add some hot water to whatever you want to clean (mug, bowl, etc.). Add a tiny drop of soap to each of them. Use your finger to froth up the water and scrub the sides. Don't forget to soap up your cooking and eating utensils. Rinse each item with clean, hot water. Dispose of your gray water water properly (see below). Lest you be tempted to skip the "rinse off the soap" step, please let me remind you of the impact of soap suds on your GI tract. Only the letter EEEE stands between bowl and bowel. If you skip the soap and lick your dishes, I cringe mildly in your direction. Bacteria can double in number every 20 minutes - how long is it to your next bowl usage? But if you skip the rinsing off the soap step, I don't want to be anywhere near your direction when the soap catches up with you. Regardless of whether you use a sink or not, you're going to need these items for washing dishes on a backpacking trip. Concentrated soap means you only need a tiny bit to get maximum cleaning power. Anything else is just a waste. If you're thinking of bringing a sponge to do your dirty dishes, please consider something less attractive to bacteria, like these double sided silicon dish scrubbers. If you're in terrain with porous soil, dig a cat hole 6-8 inches deep and pour the water into it. The soil bacteria will break down the organic components. You want this cat hole well away from surface water, at least 200 - 300 feet. And you don't want food scraps, no matter how tiny, near your sleeping area. What's tiny to you looks like a smorgasbord to an ant, who always has thousands of friends. In rocky terrain where it's impossible to dig holes, toss the water to distribute it across an area away from surface water and your campsite. See tips below for minimizing the amount of organic matter in this gray water (also spelled grey water or greywater). If you've made too much food, can it be put into an extra plastic bag or cooking pot and eaten for the next meal? Probably, as long as the temperature is not extreme and you are committed to eating it soon. If it's food that is rancid, or was gnawed on by critters, don't take a chance with it. Dispose of it in your heavy duty garbage bag. Tip: Plastic garbage bags weigh nothing, take up minimal space, and can be used for so many trail tasks that it just makes sense to bring extras. After your dishes are washed and rinsed, what do you do with them? Clean dishes that are wet can be aired out on a rock, log, or other surface away from dirt and grit before being packed away. Use a fast drying towel when you need to put away the dishes right away, as in threatening weather. You don't need a big, bulky towel to wipe off your dishes. I carry several of these small towels, and devote one to dish wiping duty. Each towel comes with a mesh sack and tiny carabiner, so you can clip it to the outside of your pack or inside the tent, anchoring it to let it air dry. You can make your dish washing chores easier before you even leave for your backpacking trip, with the right approach to how much food to bring. Take a poll about backpacking food preferences before you do anything else. A strong flavor preference or taste aversion means there will be uneaten food left after a meal. That's a disposal problem, and slows down the dish washing process as well. Don't take for granted that everyone loves what you love to eat. Focus intently on the portions of food you plan to take backpacking. Not feeling full on a backpacking trip is misery, pure and simple. Keep track of what an average portion size for yourself looks like: half a cup of cooked rice? or more like a whole cup? Factor in how hungry you'll be at the end of a day of hard hiking. Also consider the sizes, ages and genders of your backpacking buddies, so no one goes hungry after a meal. If you don't have a feel yet for how much a quarter cup of rice expands when cooked, pay attention next time you cook some in your kitchen so you can budget amounts properly. Hiking For Her can help you with portion decisions here. 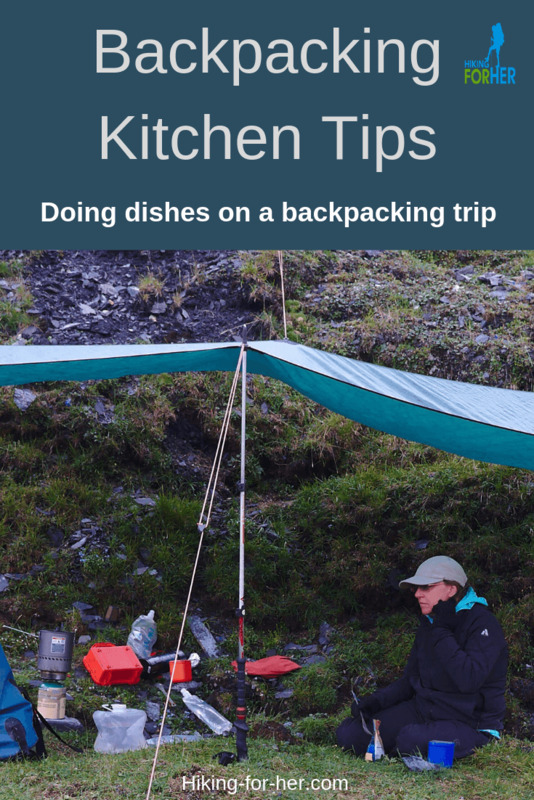 Now for some trail tips to make washing dishes on a backpacking trip less of an ordeal. At the end of a long day of carrying your backpack, all you want to do is get it off your back and take off your boots. But look around a bit. If you're at a designated campsite, you won't have the luxury of deciding where to make camp. Where is the easiest access to surface water? Is there anyone among us who has packed a backpacking stove and never blow torched oatmeal or pasta to the bottom of a cooking pot? Or not been distracted and let the water boil down too low? Sometimes one tiny, lightweight piece of technology saves you from a nasty chore of your own making. The flexible rubber end can be used to chase the last little bit of dinner around the pot and deliver it to your bowl (or mouth, if you're solo). The hard plastic end will remove caked on or burnt food from the pot before you attempt to dislodge it with hot soapy water. At 0.4 ounces and an investment of $5 US, it's one of the things that makes backpacking cooking and clean up much easier. Helps you adhere to "leave no trace" principles, too, when you aren't using wash water. More efficient than your tongue, that's for sure. If you're using dehydrated and freeze dried backpacking meals, there's no need to worry about portion control. Eat one of the meals at home to decide if "serves 2" really means it will fill you up after a day on the trail, or if you could split it between two hungry backpackers. If you're portioning out rice, quinoa, oatmeal, bean flakes, TVP or other backpacking food into your cooking pot, use a measuring cup for portion control. "Dump and hope" will lead to extra food at the end of a meal, which is a disposal problem and possibly a bear problem. Opposite scenario: you'll run out of food before the trip ends, an even more tragic situation which I'm here to tell you is NOT a fun time. Best solution: See portion tips above, and have all of your food pre-bagged. Have you ever watched a dog lick its bowl? Yup, that's you on a backpacking trip! Eat every last grain of rice, mop up the juices with your fingers or a scrap of tortilla, and lick your bowl with gusto. Whatever it takes to get all food scraps off your bowl. This extends to your cooking pots, too! Trust me, that pot scraper is worth having on a backpacking trip. It's tempting to let the dishes sit after you eat, as you enjoy the sunset with a cup of something hot. The sooner you do dishes, the less chance of congealing or cementing or the need to scrape sediments off your bowls. Clean dishes won't attract the attention of wasps or hornets, ants, mice or ground squirrels, either. Now you have some ideas for putting together your own kitchen kit for doing dishes on a backpacking trip. Think ahead to bring the best dish washing and drying tools: lightweight, harmless to the environment, fast drying, and durable. It won't take a lot of coin to put together a backpacking kitchen which easily tucks into a cooking pot or storage pouch inside your backpack. You're on your own for a method of deciding who is going to be washing dishes on a backpacking trip, however. And who's going to carry the stove.